1. A new function, cladelabels, to label membership in a clade. 2. A new function, fastHeight, to get the height above the root of the common ancestor of a pair of species. 3. 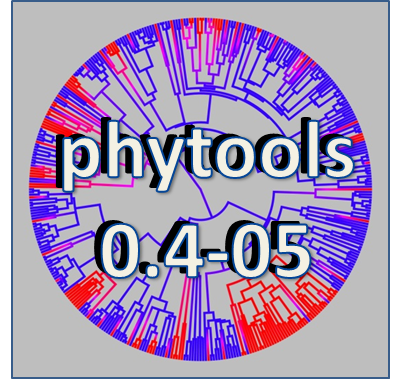 A new function, roundPhylogram (1, 2), to plot a round phylogram. 4. A new function, paintBranches, to paint an edge or set of edges on the tree. 5. Some new options and S3 methods for the function ltt95 (described here). 6. A simple new function, nodeheight, to quickly compute the height above the root of a single node. (For large trees this method will be much quicker than nodeHeights if the height of only one or a small number of nodes are of interest). 7. New plot & print methods for describe.simmap (described here). 8. Some new plotting options for contMap and densityMap (described here). 9. Finally, last & possibly least, a new function drop.tip.singleton (1, 2) to drop one or multiple tips from the tree while retaining all ancestral nodes of remaining tips from the original tree as singleton nodes. 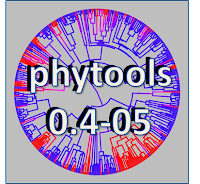 Hopefully, this new version will be accepted & posted to CRAN; but in the meantime it can be downloaded & installed from source from the phytools page. Check it out.